October 29, 2018, 9:28 a.m.
Taylor Swift stirred debate this month after breaking her political silence to publicly endorse her state’s Democratic candidate and to implore her fans to register to vote. This appeal was followed by a spike in registration numbers, and sparked public debate on whether celebrities should involve themselves in political affairs. Now a new YouGov poll finds that 52% of Britons oppose celebrity involvement in political issues, with only 9% in support. A further 33% don’t feel strongly either way and the remaining 5% answered “don’t know”. Older people are substantially more hostile to celebrities getting involved in politics, with more than two thirds (68%) opposing such interventions. By contrast, only 33% of 18-24 year olds feel the same way – in fact, a quarter (26%) are supportive of famous figures making political stands. However, most Britons (63%) say that celebrity endorsements make no difference to their views in any case, with one in four saying they have a negative effect (25%) and just 5% a positive one. While Brits are convinced that celebrity political interventions have little impact on them personally, they are far more likely to think that their peers are swayed by the words of famous people. Asked to rate on a 1-5 scale how much attention they pay to celebrity endorsements when forming their political views, the average score among Britons was 1.4 (with fully 72% of people giving the lowest possible answer of 1). By contrast, the highest scoring influence is family / friends at 2.9. However, when it comes to how much attention the rest of the population pays to celebrity endorsements the figure is more than twice as high at 2.9. 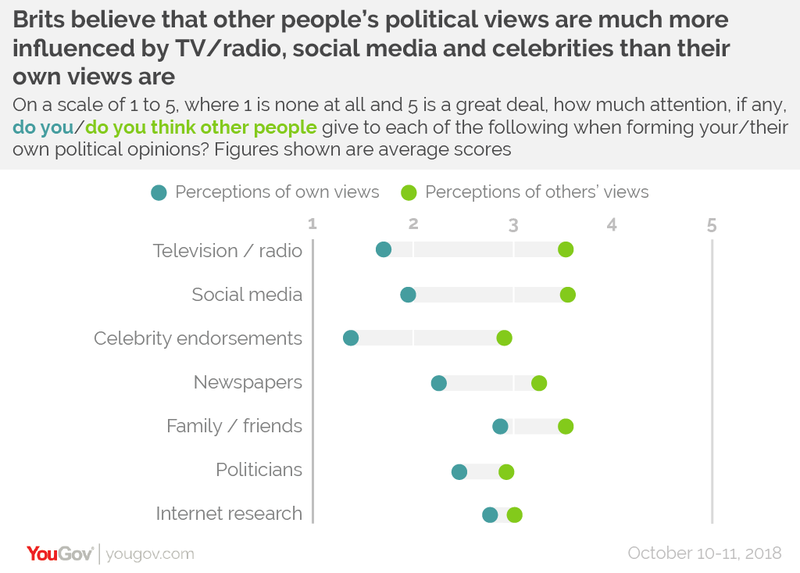 This means that the public thinks that celebrities have as much an influence on political debate as politicians (also 2.9).